Extra Rules are used to create extra payments that the employee is entitled to. If they work an exact amount of shifts. An employee may get an extra payment when working a split shift. There must be at least 1.5 hours between the shifts to be classified as a split shift, Enter 1.5 in the Apply after section. John gets a single payment for when he works a split shift. The multiplier can be generated from the number of hours the employee has worked. 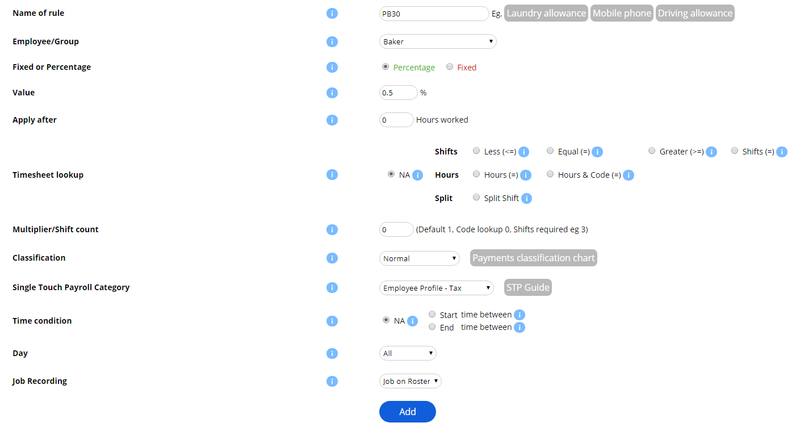 Selected Clock hours under Timesheet look up to activate this. The name of the rule will show up on the payslip. Make sure all the names are unique to easily identify why they were added. Below is an example of how you could fill this form. In this example a code PB30 is created. It applies to all Bakers. They will receive a percentage of their pay rate. That percentage will be 0.5 as they are getting an addition 30 min on their wage. They will receive this payment after 0 hours worked. How many timesheet shift exist is NA. The multiplier will be 0, because this will vary each week. Classification is Normal, because this is time related employee will accumulate entitlements. Each time PB30 is present in the notes in the calendar roster for that week that employee will receive half an hour extra pay. Example on Tuesday and Wednesday this week Aaron worked through her break. You enter PB30 as a note for those days on the roster calendar. When payroll is processed 2 payments for Alice will be added to her payslip.